Walk into all the beginnings you created this month. Realize the variety of beginnings and how they are each a new experience. We reach the last day of the month of beginnings with a last lap of the labyrinth. On this 31st day of January, never to repeat itself in essence or experience ever again, consider all the ideas, methods, and intentions that became new beginnings in this month and what they yielded as a result. Each day is a walk of the labyrinth of life, turning to move into a point or purpose and back out again, all day long. Each turn takes us into the main point, purpose or central concept in a way that spirals round and round until it reaches its apex. Every experience a new opportunity, even with the same path, person and process. 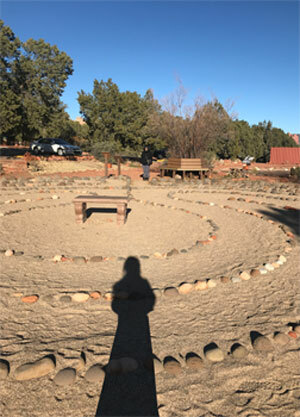 Sharing a number of labyrinths with a friend from France on this month’s journeys, this Arizona labyrinth was an old favorite that had new beginnings with an old friend, a medicine wheel and a sweat lodge that had been included. What was old was new again and when its shared with another, there is always something more to see and experience. 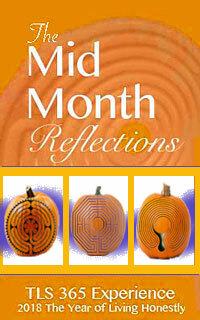 What area of the labyrinth is the most contemplative and offers the most insight? Notice how many insightful places provide awareness and contribute to your walk. 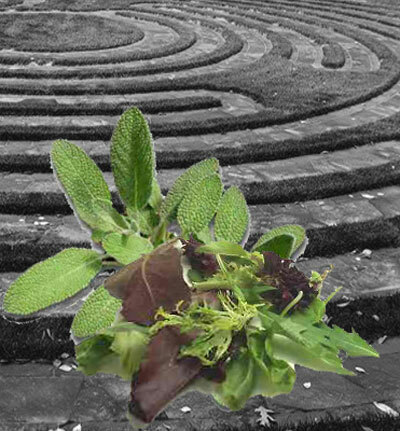 Guided by an initial obsession with spirals, I created garden designs of labyrinths with herbs that led into a centered contemplative place. This morphed into an awareness that the labyrinth was the answer to quieting the mind long enough to be actively silent and able to deepen my prayer life. The kinesthetic layers spoke volumes to me and ignited a need to share the experience and to learn more about labyrinths. Going in Circles Makes the Feeling More Revealing. Spirals and turns and circling in, how can we come out better again? In the circles you create, what makes you feel great? 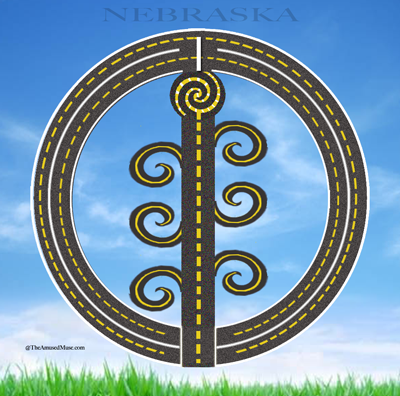 Nebraska is the gateway between two important personal destinations. Selected for its time saving feature, the duration from one point along Interstate 80 from the Colorado border to the Iowa border is a straight point from end to end. On either side of the expressway lay open fields with an ever expansive open sky that appears to make it last forever. The state of humor might well be Nebraska as the drive from west coast to the midwest encounters the uneventful nature along this route and creates cause for imagination to occupy the monotony of what seems an endless voyage. The view from the expressway appears to be a moving picture that simply does not change for just under 400 miles. Finding the humor in this day was discovered in finding inspiration in the uninspired surroundings. Drawing a labyrinth included the straight six hour journey, though realization of the spiral occurred in the use of the off ramps that provided a circular reference for leaving the highway to refuel, spiraling back afterwards to resume the trip. The off ramps provided opportunities for food, sanitary necessities and stretching the body and with each, what seemed dull, suddenly had lively possibilities. The double spiral at the top suggests a centering point before returning again…. or freedom to the other worlds of Iowa, Colorado and beyond though only temporarily as there will be a return home again. The repeating process through the double spiral and back down the straight highway of spiraling off ramp diversions awaits when ready or time permits a brand new path elsewhere. Making inspiration out of the uninspiring has made an amusing difference in perceptions of Nebraska. Discover an imaginative way to walk the same path differently. Be amused by your imagination and the variety of ways you find. The First Day of Spring Arrives and with it a rise in what spirals into bloom, up from the Earth and into our visual awareness. Whether it is a seed or plant budding or the birth of something new, it is a time when things begin to look up. Goodbye to the winter months of hibernation and an invitation to unfurl, open and rise up into this day that marks our calendar year of Spring’s change of season. Spirals come in many forms, found in the natural environment or the man made one, following the spiral to meet its destination is a reckoning of path with purpose. Celebrating Spring with travels made for an early morning walk in a new state, new direction, new labyrinth and new season for new ideas. Spiral into renewal. Walk in newness and with a budding birth and observe what opens for you. When I walk the labyrinth, it is often to bring up thoughts, feelings, ideas and questions that are floating around inside of me and wish an external outlet. As I take steps onto the path I am headed inward and the awareness of my body, mind and soul alignment are brought to my attention. Sensory perception awakens constriction and location. The more steps that traverse the path inward, the more the emergence of emotion and logic that arise, observe without intrusion. The walking body negotiates the turns and sets the pace of function and as the application of movement spirals inwards traversing the pattern of back and forth, the gentle rocking of what is unimportant loosens and releases the unnecessary in the constriction. By the time the center has been reached in the labyrinth, the falling away of what is not relevant reveals a true question from the former constriction. The question can now more uniquely fit to evolve circumstance. Knowing a true question, makes finding the walk of the answer one of application and allowance. The walk of reverse is where the additions become the discoveries and the journey to the answer is one of purposeful and practical curiosity. 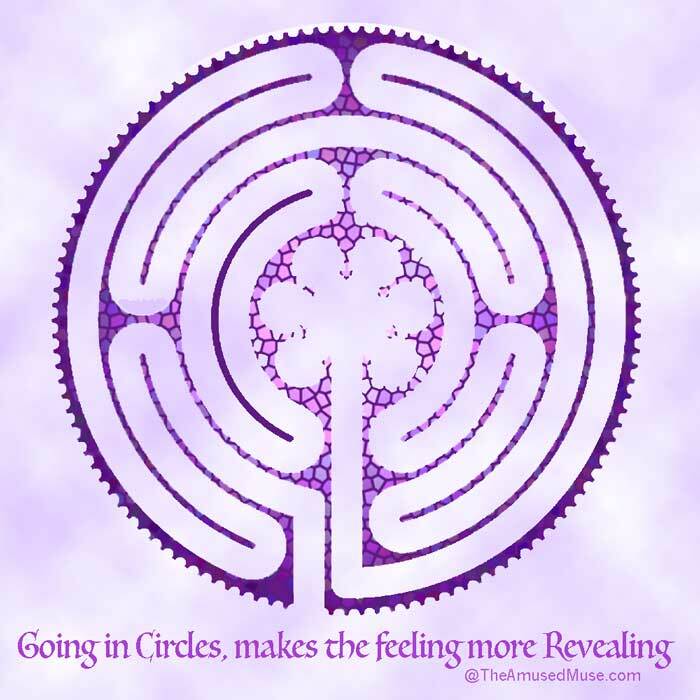 In this quarterly focus of education, the idea of what the labyrinth offers for the intuitive nature is a life education of what we have within. The way of the path provides a walk into possibility, the moment we engage with our first step. Not always, but often a question is asked at the beginning. It is an intention for meaning of the walk, though with the relaxation that takes place in brain and body, what can come forth is an internal knowing along with an understanding that can direct us to the details that come along with that intention. I find when I walk as a practice, I develop more of my knowing and growing intentionally and intuitively. 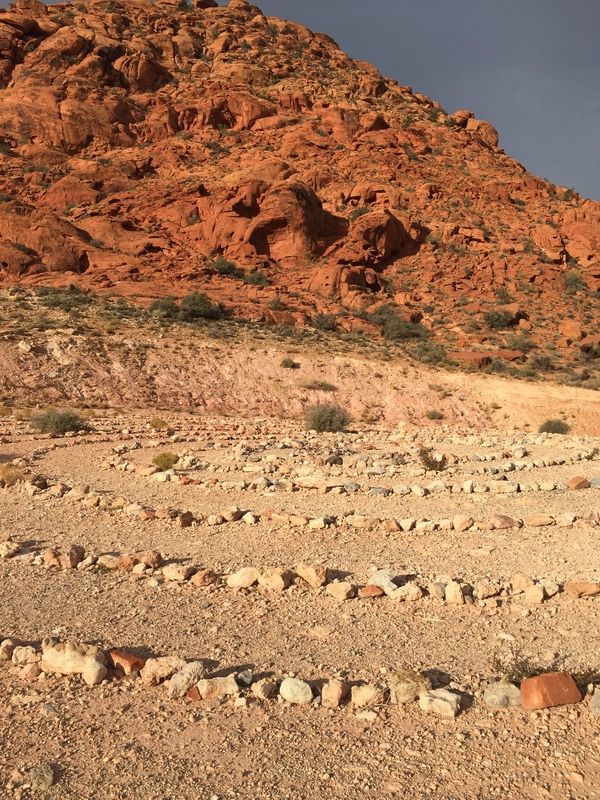 On this day of celebrating Earth Day, the Red Rock Canyons of Nevada encircle the circle of the labyrinth, keeping it as a refuge to those who come upon it, those who use it for days like these and those who want to commune with the natural essence of the labyrinth in a most natural setting. 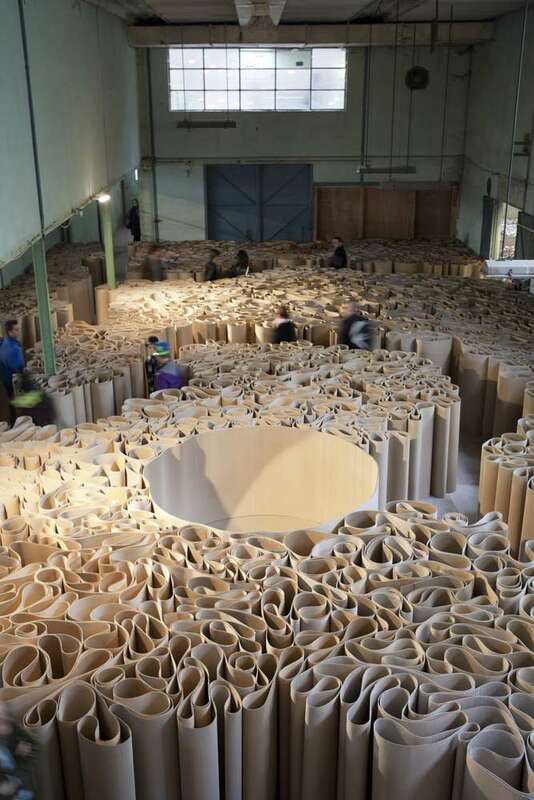 It is a contemporary design with two spirals, and what is very Earth-like about this labyrinth, is that the ending and beginning points tend to shift from time to time as a result of how it is used by human kind. A fitting labyrinth with a fitting message for Earth day about appreciation and respect for Earth’s use while we are here.